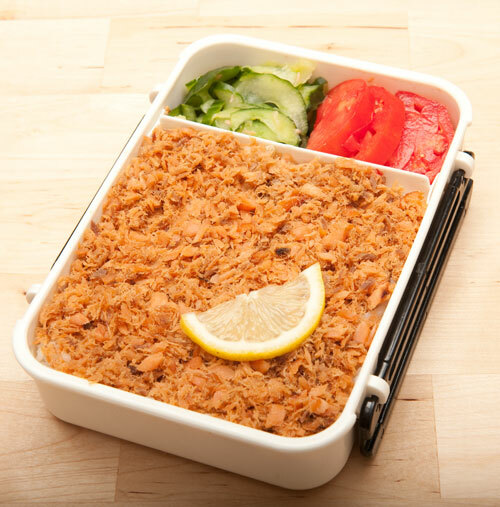 There are also several post with “also-ran” bentos, with brief descriptions and photos. 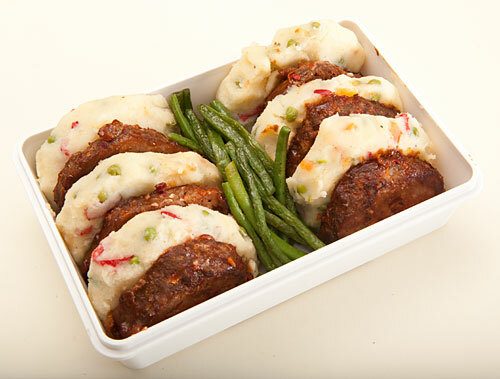 Follow this link for the “also-ran” bentos . Or to see all the bentos posted on the site follow this link for a list in reverse chronological order . Bentos no. 1- 30 . Time needed: The approximate time needed in the morning to prepare the bento. More time might be required to make things in advance. Bento no. 55: Almost Empty Refrigerator Bento. Time needed: 10-15 minutes. Calories: 515. Type: Leftovers, pasta, omnivore (beef). Link . Bento no. 54: Hallowe’en Zombie Kitty Bento. Time needed: At least an hour, probably 2. Calories: 480. Type: Japanese, decoratie kyaraben/charaben, omnivore (beef). Link . Bento no. 53: Sesame beef and vegetable bento. Time needed: 10-15 minutes in the morning. Calories: 440. Type: Japanese, omnivore (beef). Link . Bento no. 52: Special occasion omuraisu (rice omelette) bento. Time needed: 20-30 minutes in the morning. Calories: 700. Type: Japanese, decorative kyaraben/charaben, omnivore (egg, wiener sausage). Link . Bento no. 51: Warm vegetarian chili bento with pumpkin-corn-yogurt mini muffins. Time needed: 5-10 minutes in the morning. Calories: 550. Type: Warm (using thermal bento), not Japanese, Southwestern. Link . Bento no. 50: Vegan bento with quinoa parsley pepper salad and currie kidney beans. Time needed: 5-10 minutes in the morning. Calories: 450. Type: Salad, not Japanese, vegan (quinoa, kidney beans), gluten-free. Link . Bento no. 49: Rice burger bento with green vegan tofu burger. Time needed: 20-25 minutes in the morning. Calories: 520. Type: sandwich, omnivore (chicken). Link . Bento no. 48: Salted chicken sandwich bento. Time needed: 5-10 minutes in the morning. Calories: 435. Type: sandwich, omnivore (chicken). Link . Bento no. 47: Panfried chicken mini-burger ben to. Time needed: 5-10 minutes in the morning. Calories: 400. Type: Japanese, omnivore (chicken). Link . Bento no. 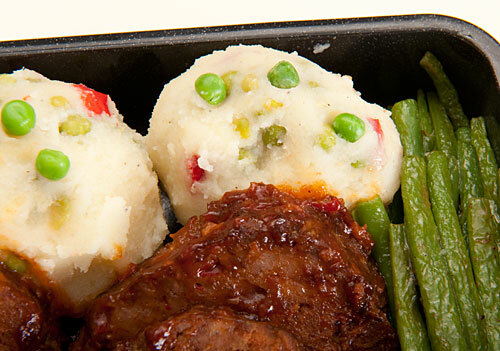 46: Stewed chicken dumpling bento. Time needed: 5-10 minutes in the morning. Calories: 355. 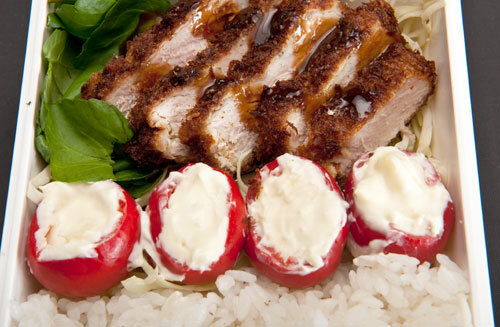 Type: Japanese, omnivore (chicken). Link . Bento no. 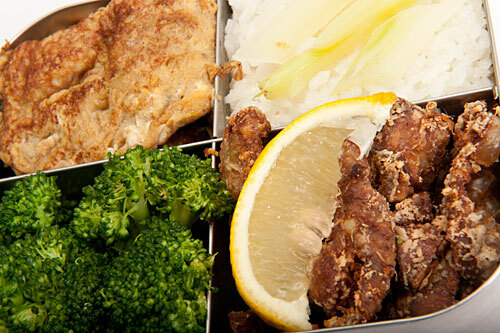 45: Lemon chicken nugget bento. Time needed: 10-15 minutes in the morning. Calories: 410. Type: Japanese, omnivore (chicken). Link . Bento no. 43: Low-calorie bento with ‘no-calorie’ shirataki noodles, lots of vegetables and vegan shuumai dumplings. Time needed: 10 minutes in the morning. Calories: 245. Type: Asian, vegan with homemade vegan shuumai dumplings . Link . Bento no. 34: Vegan dry curry bento, cucumber and cherry tomato yogurt salad, broccoli. Time needed in the morning: 10. Calories: 420; Type: Japanese, vegan (soybeans or tempeh, yogurt). Link . Bento no. 33: Frozen shepherd’s pie bento with broccoli, cherry tomatoes, pickles. Time needed in the morning: 5. Calories: 570; Type: not-Japanese, omnivore (ground beef). Link . In addition, some also-ran bentos  that didn't make the list. Also-ran bentos are those with briefer descriptions, and no calorie counts etc., but I hope they will still inspire you. 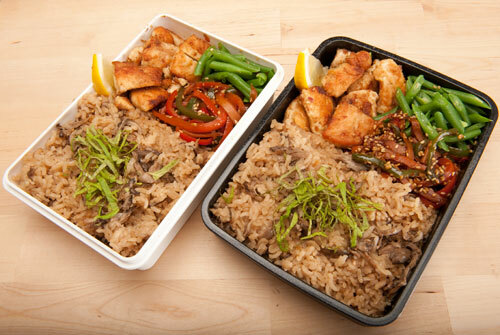 Most rice-based bentos are gluten-free, but see the instructions for details. For Japanese recipes, make sure you are using gluten-free types of soy sauce, miso and so on if you are seriously allergic. Bento no. 81: Bean sprout burger bento with favorites. Time needed: 5-10 minutes in the morning. Calories: 630. Type: Japanese, classic, rice based. Link . Bento no. 80: Deconstructed bánh mi sandwich bento. Time needed: 5-10 minutes in the morning. Calories: 510. Type: Asian, deconstructed sandwich, bread-based. Link . Bento no. 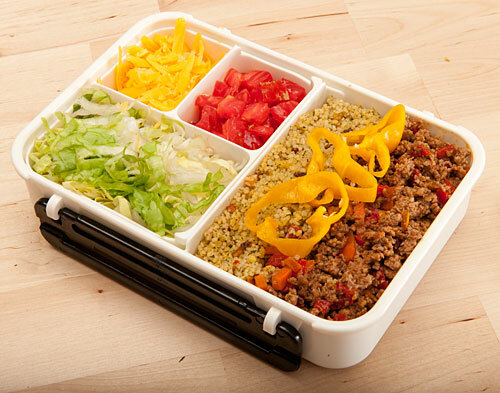 79: Low-carb, gluten free sandwich bento. Time needed: 30 minutes in the morning if everything if made from scratch (recommend making 'bread' in advance'. Calories: 650. Type: Low carb, gluten-free, alternative sandwiches Link . Bento no. 78: Vegan low-carb bento. Time needed: 30 minutes in the morning if everything is made on the spot. Calories: 250. Type: Japanese, vegan, low-carb, low-calorie, gluten-free! Link . Bento no. 77: A simple bento assembled from freezer stash and leftovers. Time needed: 5-10 minutes in the morning. Calories: 490. Type: Not really Japanese, made-ahead, omnivore. Link . Bento no. 76: A bento made almost entirely in a rice cooker. Time needed: 5-10 minutes in the morning, 5-10 minutes prep time the night before, plus 20-30 minutes cooking time. Calories: 380. Type: Japanese, rice cooker bento, omnivore. Link . Bento no. 75: An entirely made-ahead bento featuring mini cabbage rolls. Time needed: 5-10 minutes in the morning. Calories: 405. Type: Japanese, make-ahead, omnivore. Link . Bento no. 74: 5 minute, no stash, no stress beginner bento, omnivore. Time needed: 5 minutes in the morning. Calories: 460. Type: not Japanese, deconstructed sandwich, for beginners. Link . Bento no. 73: Asparagus salad and quinoa spring bento. Time needed: 25-30 minutes the night before, 10-15 minutes in the morning. Calories: 490. Type: not Japanese, alternative grains, gluten-free. Link . Bento no. 72: Sakura Love Kyoto Style Barazushi Bento. Time needed: 15-20 the night before, 15 minutes in the morning, plus staple. Calories: 635. Type: Japanese with a twist, fish, no meat. Link . Bento. 71: Tiger Corn Muffin and Soup Bento. Time needed: 25-30 minutes to decorate the muffins. Calories: 510. Type: not Japanese, theme, charaben, muffins, lacto-ovo-vegetarian. Link . Bento. 70: Even Kale Can Be A Christmas Bento. Time needed: 5-10 minutes in the morning. Calories: 460. Type: Omnivore (bacon), not Japanese, winter, seasonal. Link . Bento no. 65: Pink, green and yellow spring bento featuring green pea rice and salted salmon. Time needed: 10 minutes the night before, 15 minutes in the morning. Calories: 460. Type: Omnivore (salmon, egg), Japanese. Link . This is a series of posts featuring bentos made by my spouse, aka The Guy. The Guy is not Japanese, didn't grow up with bentos (but loves the ones I make for him) and is somewhat tentative in the kitchen when he gets out of his comfort zone. See how he gets along in the world of bentos. It’s been quite a long time since I last posted a complete bento…but if you’ve read my previous posts, you know that I have a good excuse ^_^;. Well, I am not feeling too chipper, and on top of that I don’t have a real kitchen. STILL. Those two situations combined have made me very reluctant to attempt any kind of cooking. My appetite is not too good either to be honest. While I’ve been sidelined as the main cook in the house, The Guy (aka…the spouse, who occasionally posts around here as Guruman) has been taking care of the food supply chain, manfully. Now, The Guy is not exactly a born cook. He never really learned how to cook when he was growing up. (He was a precious and coddled only son of a couple who had him fairly late in life, in Switzerland, a nation where women only got the right to vote in 1971. Of course they’ve made great strides in women’s suffrage since. But I digress.) He does love to eat though, and did pick up some recipes after he left graduate school and struck out on his own. He has a repertoire of about 5 or 6 dishes, which he makes very well - and often. But normally, he’s in charge of doing the dishes - a critical job in any kitchen workflow. Attempting new stuff is a bit of an issue though. Being an engineer, he can follow recipes, though the process is very laborious. He has to read and re-read a recipe several times, as if they were machine operating instructions or something, before he’s comfortable enough to try it. Despite that, he has bravely decided to take on the challenge of making bentos for us for lunch at least once or twice a week. We’re sliding back into the sandwiches-or-fast-food rut during my time on the kitchen disabled list, and that’s not good for either of is. So, here is The Guy’s very first attempt at a bento made all by himself. The components of the bento was suggested by me. For his first bento, I figured that a really no-fuss approach was best. So we went for the bed-of-rice-with-stuff-on-it style, which is really the easiest to prepare and pack. Only 3 elements are in this bento (plus a decorative lemon slice), but it’s still fairly well balanced I think. The taste? Not bad, not bad at all. His was packed in his favorite plain black bento box, while mine was in a white box. Despite my lack of appetite, I gobbled up the whole thing. a bed of sushi rice  (that’s rice flavored with sushi vinegar). White rice yes, because at the moment one of my medications is making me not want a lot of fiber, if you know what I mean. >.< The Guy got creative and added a bit of lemon juice to the vinegar mix, which was very nice. 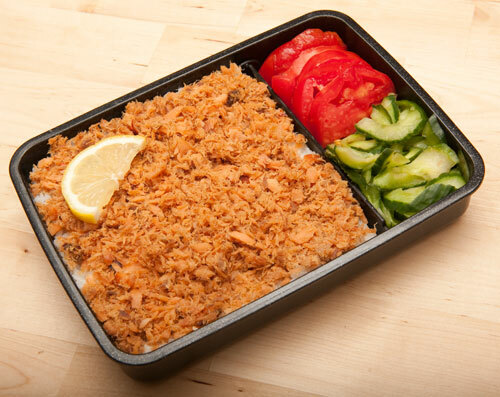 Topped by lots of Salmon furikake  or salmon soboro. We made it a less salty than the recipe, since the sushi rice has some salt in it too. Chopped up cucumber and tomato salad. Since the salmon and sushi rice was fairly salty, this was left plain, and that worked pretty well when everything was all mixed up. The Guy only had two small pieces of salmon to work with, but he now sees that salmon furikake can be made in quantity, and he vows to do that and stick the excess in the freezer. A very promising start I believe. It did take him a rather long time (due to the engineer-tendencies thing) but he seemed happy with the results, and I was too. I am hoping that he will feel encouraged enough to continue. 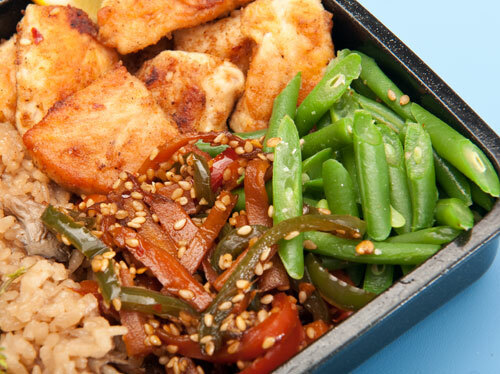 Homemade bentos are so much better in all ways that takeout or fast food. Stay tuned! For his second bento (which actually appeared twice), The Guy tackled a bento based on an Okinawan speciality, taco rice. Taco rice is basically an Okinawan/Japanese take on that Tex-Mex classic, tacos with spicy ground meat. There’s quite a strong American influence in Okinawa, due to the existence of a huge (and rather controversial) U.S. military base there, plus the fact that the United States occupied the Okinawan islands from after WWII until 1972. 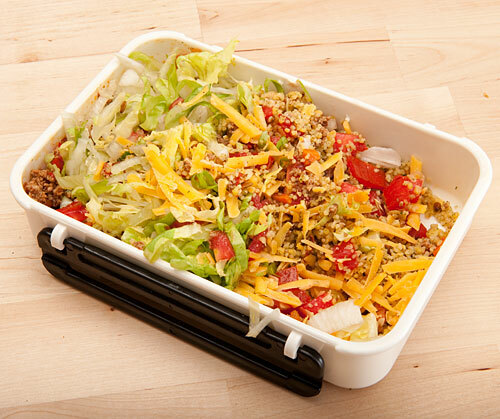 Instead of the corn tortillas or chips used in American taco-type dishes (including taco salad), taco rice uses rice as the base. Anyway, for this bento, The Guy had no trouble making the taco meat base part, which is a staple around our house . As mentioned, he made enough for at least 2 rounds of bentos. He did decide to mix it up by using a packaged spiced couscous mix* instead of rice. The rest was fairly easy: shredded lettuce and cheese, cubed tomato, plus a bit of fruit in the form of grapes. The results were really tasty, though we both agreed that plain couscous would have been just as good since the meat mix was a bit on the too-spicy side. Then dumped the sides into the main container and mixed everything up. Very good indeed. If you like it heated up, do so before adding the lettuc and tomato. For this bento, The Guy used two of his favorite foods, the mushroom rice and the chicken nuggets. (I myself am particuarly fond of those nuggets, hot or cold. They are great with pasta or mashed potatoes as well as with rice.) He was a bit stumped as to what vegetables to use, but we had a few green beans left and we always seem to have some bell peppers lying around, so he made a kinpira with the peppers (the recipe is in the Just Bento Cookbook , or you can work off of the recipes here for other kinpiras ). He did a fancy ‘French-cut’ on the beans and blanched them. Here’s the two bentos together (mine is the white box). He thought that the mushroom rice looked too beige, so added some chopped up shiso leaf as garnish. The flavors of shiso and mushroom together were interesting! Here’s a closeup of the non-rice parts. Very colorfully arranged, don’t you think? This is the first bento that The Guy made entirely by himself, with no input from me. He made just the one bento instead of the two he usually makes, because there was only one tonkatsu left over from the night before. (I had something else for lunch.) For these reasons packed the bento with things that he loves, that I don’t necessarily like! First up, the tonkatsu. In case you don’t know, tonkatsu is a breaded and deep fried pork cutlet or filet (an old recipe for it here , though I’m working on a more detailed version). I must admit that while I do like tonkatsu, The Guy likes it a lot more than I do. 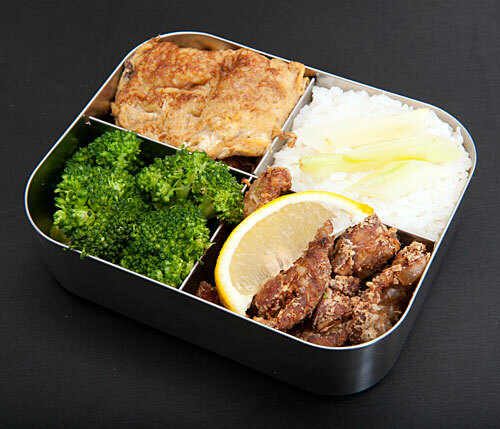 I can’t really stand to have it for dinner and then lunch the next day - a bit too much breaded fried goodness for me - so having just the one piece held over for his bento (on purpose of course) worked out great. One of the conumdrums that arises when packing deep fried and breaded or battered food into a bento is, how to deal with the fact that the breading or coating gets a bit limp and no-crispy? One approach is to just embrace that limpness and coat it with a sauce. That’s what the guy has done here - he’s coated the piece on both sides with “Bulldog” tonkatsu sauce (you can use brown steak sauce), which melds with the breading to achieve an interesting texture and flavor. The other thing he packed which I’m a bit unsure of is pickled round peppers stuffed with a mixture of goat cheese and a little mayonnaise. The peppers come in a jar, and are hot and sour. The Guy loves them. The filling is just mashed fresh (not aged) goat cheese with a bit of mayo to loosen it up. You could use cream cheese for a milder flavor. Rounding out the bento is some of the leftover shredded cabbage from our tonkatsu dinner, which The Guy stir fried a bit with salt and pepper, and some mâche (lamb’s lettuce, corn salad) for greenery and garnish. The bento box he used is one that makes an appearance here frequently - a plain white one from Muji  (Mujirushi Ryohin). I’m not sure they carry the same model anymore, but Muji always has a couple of bento boxes for sale; a plain single-tier, like this one, and a plain double-tier. Both are simple and functional like most Muji products. So there you have it - rather filling bento with pretty strong flavors. What do you think? At this point The Guy is pretty much on his own with his bento making, and he’s branching out in ways that I would have not imagined. I’ve said this before on these pages, but sometimes I think that I’m a bit too stuck in my Japanese ways when it comes to bento composition, so it’s always fascinating to see what people like Mr. Guy who don’t have all that cultural baggage come up with bento-wise. He does still peruse the pages of this site for inspiration, and that’s how he came up with this very substantial bento. 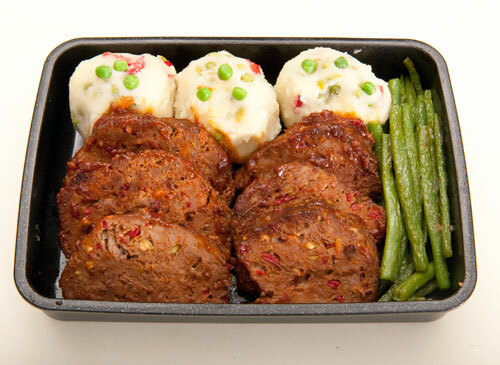 It consists of three elements: meatloaf, sauteed haricots verts or green beans, and mashed potato dumplings with vegetables. The green beans were blanched for a couple of minutes in boiling water, then sauteed in olive oil. This is the variation he packed for me. It was a very substantial bento, so hefty in fact that I couldn’t finish it all in one go! I ate the rest for an offbeat breakfast the next day, and it was still very good, even after a night in the fridge. The Guy did finish his, and was very satisfied indeed. 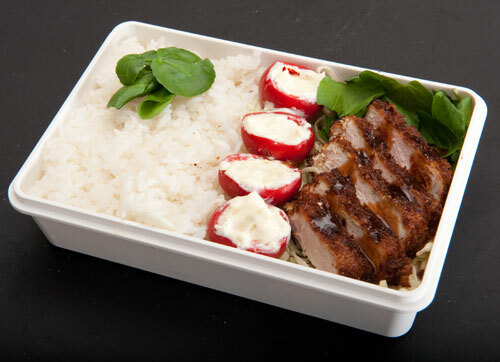 I would note that while this bento was great at room temperature, it would be even better if you can warm it up in the microwave. So, if you know someone who doubts that a bento 1. has to be rice based, or 2. can’t be filling enough, try packing one like this for them! Yes, The Guy Does Bento is back doing bento! This one is based on the hearty meatball and vegetable soup  that I posted yesterday . 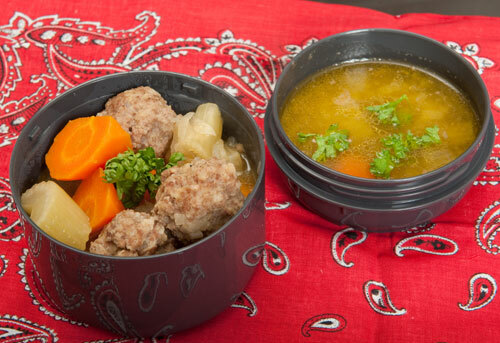 The soup is a meal unto itself really, but it’s been made even more filling and substantial in this set that uses a thermal bento set . Here’s the whole thing: the soup, about half a cup of rice (got to watch those carbs/calories!) with a little gomashio (sesame salt)  sprinkled on top, and sauteed broccoli made from leftover steamed broccoli. I don’t have a recipe for the broccoli but it’s dead easy: just precooked broccoli (you could also use frozen broccoli) sauteed in a little olive oil with chopped garlic and a sprinkle of dried red chili peppers. As you can see, the soup is actually in two containers. 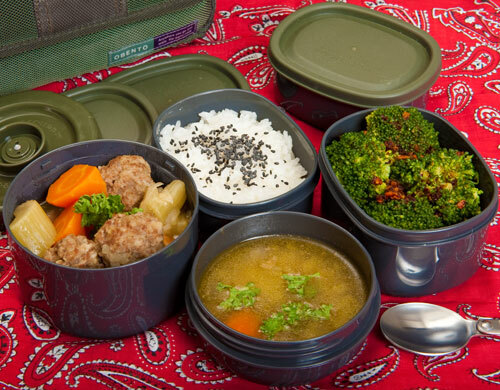 The reason for this is that a standard Japanese thermal bento set usually comes with a small container for soup, plus a larger one for rice, both of which can be kept warm. 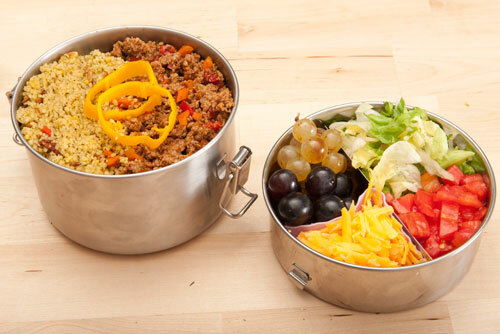 (The largest container is for rice since originally, these thermal bento sets were intended for use by people with hearty appetites who wanted to eat a lot of rice!) 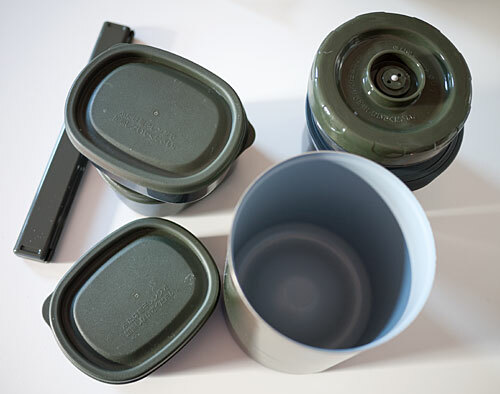 Both have tight fitting lids, but the soup one is really leakproof, so we put more liquid in that one, and the solid parts in the rice container. The hot liquid can be poured over the solid parts, or they can be enjoyed as two courses. There is a detailed description of this particular bento set in my overview of thermal bento sets and lunch jars ; it’s the second one described. (J-List has 1 in stock , and similar ones are available in many designs; see Bento&co  or J-List  for example.) A standard Mr. Bento  will work too. Up until now The Guy bentos haven’t put much thought into calorie totals! But now that The Guy is watching his waistline with an eagle eye, I’ll put in an approximate calorie count for reference. (It’s a bit harder to be precise with The Guy bentos, since I don’t pack them myself of course.) This bento is around 600 calories: 350 for the soup (there’s 5 meatballs in there), 100 for the broccoli (a bit generous on the oil), plus 150 for 3/4 cup of cooked rice. Not bad for a very filling lunch. You could shave off more calories by having plain steamed broccoli and still be very satisfied. Both the soup and broccoli are planned leftovers from dinner the night before. Making planned leftovers (that just means making a bit extra) saves so much time. 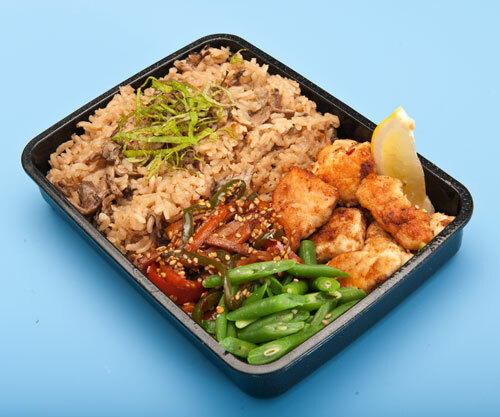 For this bento, the total prep time in the morning is about 10 minutes: to heat up the soup and the thermal container, defrost some rice and pack it, plus sauté the broccoli. The Guy did cheat a bit on the broccoli and use a chopped-garlic-in-oil mix we have in the fridge. He used two burners, the microwave for heating up the pre-frozen leftover rice , plus an electric kettle, one of our essential bento making supplies . The Guy Does Bento is back! This is one he made just for himself on a day I was feeling too sick  to eat much of anything. Now that I am slowly getting my appetite back, just looking at it makes my mouth water. The box used is the LunchBots Quad . 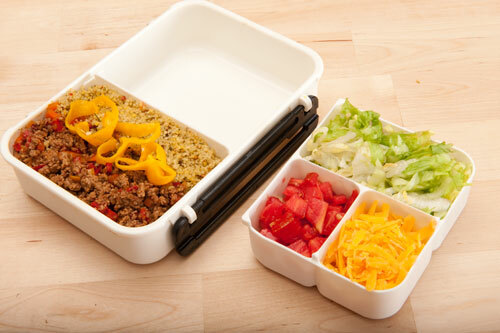 The Guy likes bento boxes with compartments, like this one and the Idea box  (the latter one may be his favorite of them all) because it helps him to organize the food without thinking about it too much.